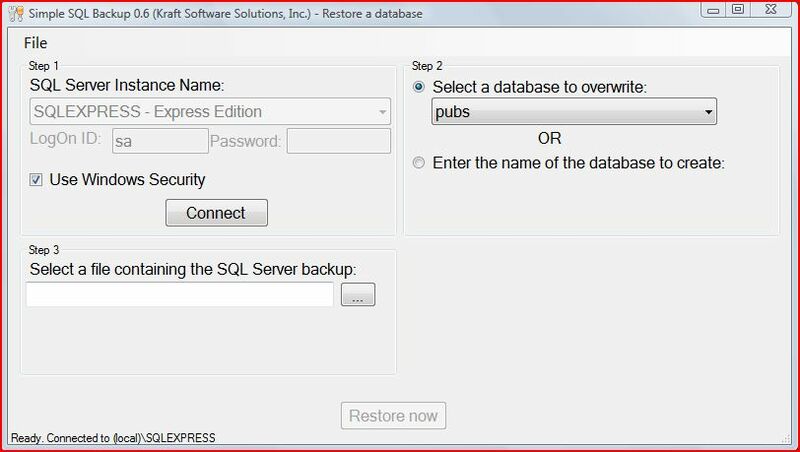 An easy way to backup, restore, or move SQL Server databases! FREE! 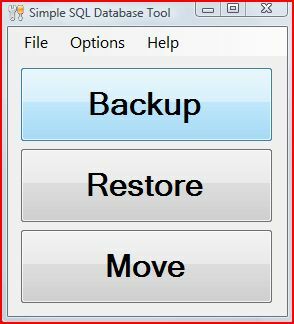 Simple SQL Backup is a free software program intended for use by network administrators. It makes performing an immediate backup of a SQL Server database very easy (easier than opening the Microsoft provided SQL Server administration tools). 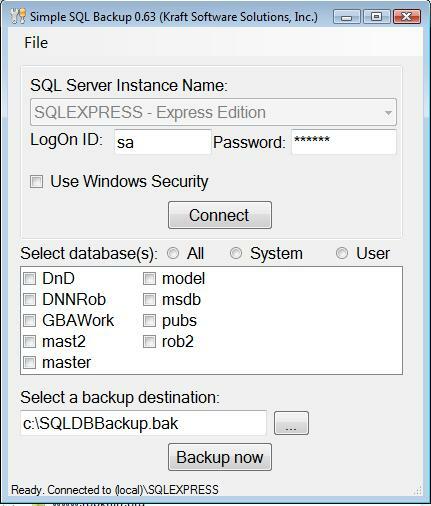 Simple SQL Backup works on any edition of SQL Server 7.0, SQL Server 2000, SQL Server 2005, or SQL Server 2008. Click an image above for a larger view. Version 0.66 is currently available on this site. Download version 0.66 by clicking here. This program requires the .Net 2.0 framework. It will NOT run on Windows NT 4.0. It will run on Windows 2003 Server, Windows Server 2008, Windows 2000, Windows XP, Windows Vista, and Windows 7. The current version is 0.66. The original release was version .51. Version .52 fixed a bug connecting to the default instance (MSSQLSERVER). Version .60 added restore and move. It also added logging. 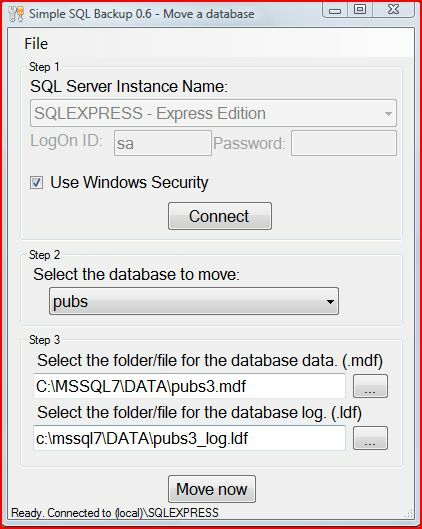 Version .61 added support for SQL Server 2008 (beta). Version .62 fixed a bug connecting to some installations of SQL Server 2000. Version .63 allows you to backup multiple databases into one backup file. .63 can store the database logon and password in encrypted form in the registry. .63 also includes an installer. Version .64 allows 10 minutes for a backup to complete (previous versions allowed only 30 seconds). .64 provides an option to not store the user password in the registry. It also uses a stronger encryption technique for storing the password in the registry, and it stores data in the user registry instead of the local machine registry. Version .65 Changed multi-database selection radio buttons to check boxes. Version .65 Fixed a bug that occurs if you attempt to restore from a multi database backup file but do not select the specific database to restore. Version .65 Will retain the resizing of your backup form. Version .65 Allows the backup to backup separate databases to separate files. Version .66 The program will warn you if you are working with a database that is not using the Simple recovery mode. You can disable this warning in options. Version .66 ENH - The program allows searching for SQL Servers on the computer if the SQL Server is not found in the registry. If you would like to be notified of updates to this program, or when related programs are available, please provide $1.99 payment by clicking on the button below. This software is provided by Kraft Software Solutions, Inc.